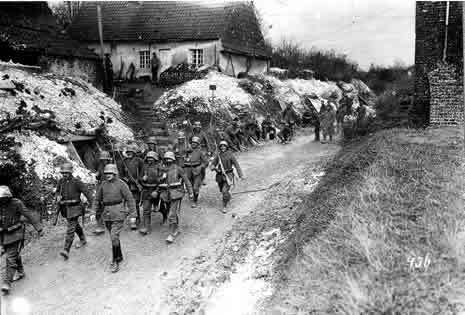 Photograph of a party of German troops passing through a village in East Prussia, undated. Soon after the outbreak of war in August 1914, Russian troops poured into the German territory of East Prussia and made some striking initial gains. However, they were soon heavily defeated at the Battles of Tannenberg and the Masurian Lakes in late August and early September. These colossal victories allowed the German army to re-establish its authority in East Prussia and begin a successful counter-offensive. This photograph, which was probably taken in the autumn of 1914, shows a group of good-humoured German soldiers passing through an un-named village. They are presumably heading eastwards towards the territories of the Russian empire.